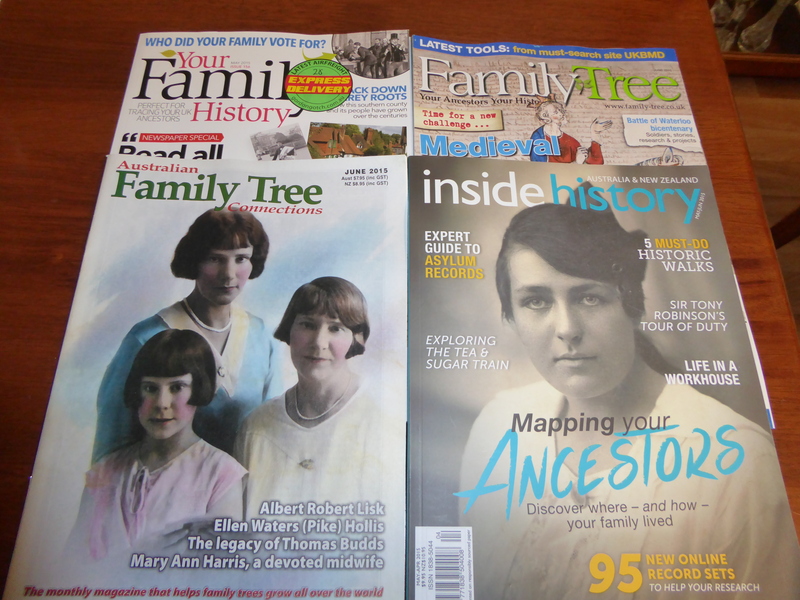 Do you have a favourite genealogical magazine? Here are some of mine. Your Family History, (top left, English) is one I sometimes pick-up, if I think the contents are interesting. This one has an interesting article on The Making of America. This looks at the British and Irish, who started news lives in America. There is also an article on the Bismarck. It find it useful and enjoy reading readers queries and how to solve them. Family Tree, (top right, English), this is the one I subscribe to and I find the articles, columns and sections very informative. The previous few months have had a series on how to blog and as a blogger, I discovered some useful tips. This month has an articles on the Magna Carta, Waterloo, The Salvation Army and by Chris Paton, Lost & Found in the archives. Australian Family Tree Connections, (bottom right), has readers stories and photos, Surname Register and What’s on. It has been on the Australian scene for years and Michele Stephens as kept the same format, from the start. I enjoy the stories of how others have solved a problem. Inside History, (bottom right), is a wonderful fresh magazine that I have to stop myself reading in one sitting. Cassie Mercer is the editor and the range of articles, interviews etc. are very diverse. This one has a guide to asylum records, that I wish I had had before I went down that path. The article on Historic Walks is extracted fro Barry Stone’s book, 1001 Walks You Must Experience Before You Die. Something to think about, now we are retired. There is also reviews on Apps and new books. Mapping Your Ancestors is excellent. These are my favourite, tell me about yours.